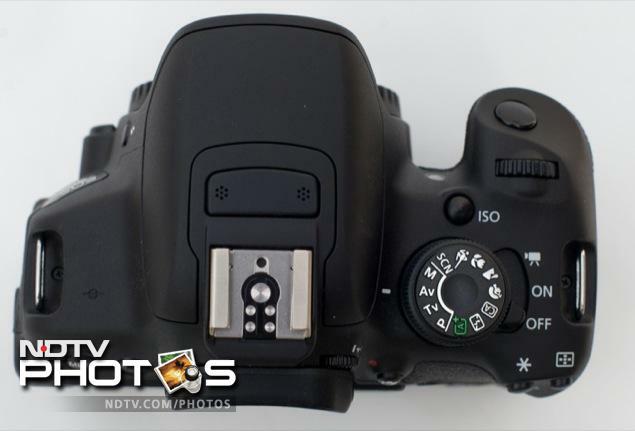 Canon EOS 700D is the 'flagship' device in company's entry-level consumer DSLR range. Canon has included some creative features as well as a very responsive capacitive touchscreen to make sure this camera appeals to first time users as well as those looking for an upgrade. Bundled with the camera is the 18-55 f/3.5-5.6 stock lens. So how does it work, let's find out. The first thing you notice about the 700D is its petite frame, slightly smaller than the previous generations and much lighter when it comes to weight of the body alone. Canon EOS 700D is one of the lightest DSLR cameras that I have come across, slightly smaller than most entry-level DSLR cameras, and lighter, at just 580 grams for the body with the battery and a SD Card inside. The bundled kit lens adds another 200 grams to this, making it pretty light to carry around on a holiday or a trek. The body is made of stainless steel covered in polycarbonate resin and glass fibre making it durable to take on the challenges of day to day photography. The controls are well placed and easily accessible, and the 180 degree tilt touchscreen is bright, responsive and full of detail. I also liked the fact that the card slot is on the side and not at the bottom. This means you easily swap out the card when you have the camera mounted on a tripod. The bottom part of the camera has just the battery slot and tripod mount, while the front of the camera has no buttons or controls. On the top side of the Canon EOS 700D, over the grip, you have the shutter button, the Aperture and Shutter control dial, ISO Button, a Mode Dial, and three-position toggle on-off switch, that switches off power, switches it on and moves to the video mode. Also on the top, next to the hot shoe are the built-in stereo microphones, and the pop-up flash. On the back are your usual buttons, including a D-Pad that lets you choose between white-balance, multiple shots and AF Mode. A big advantage with the camera is that all the settings are clearly visible on the big 3-inch vari-angle touchscreen LCD, so if you don't know how to move around using the buttons, you can always touch the screen to get to the setting you are looking for. 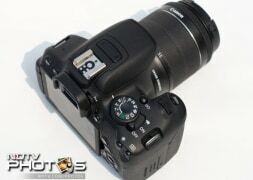 There is also a dedicated button that shuts off the LCD and switches to the viewfinder. What is nice to see is that though all functions and settings of the camera can be accessed via the touchscreen, Canon has still included the buttons that let you scroll through the settings, which come in particularly handy if you are an experienced Canon user who's gotten used to things being a certain way. As I mentioned earlier, Canon likes to call the 700D its flagship entry-level DSLR, and I put it under some great tests, including late night handheld street photography and some light blurs, and, overall, the camera performed very well for an entry-level DSLR. The Camera can shoot JPEG and RAW Images, and also save both of them, though remember that if you choose to save images as RAW (or indeed both), you are advised to have a faster card, else you'll have a bottleneck while taking shots. On the Mode Dial, you choose between Av (Aperture Priority), Tv (Shutter Priority), M (Full Manual), Portrait (P), SCN (Scene), High Speed Sports, Macro, Landscape, Portrait, Full Auto (A+), CA and a No Flash Mode with Full Auto where flash does not fire. It was also good to note that the lens Canon is now including in the kit is image-stabilised and is the new avatar of its entry-level lens, giving you a good control on image stability both in video and still mode. There is no built-in GPS but the camera can take an optional GPS-E2 unit if you need GPS functionality. 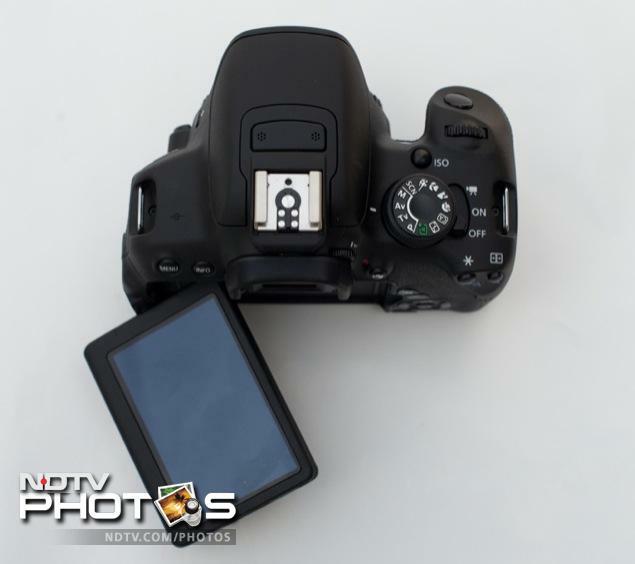 The Canon EOS 700D does not charge via USB so you need to take the battery out and use the supplied charger. The battery lasts you anywhere between 400 and 440 shots, so if you are a light use photographer out for a holiday over a weekend, you can probably leave the charger behind, but in most cases you will need to carry it along with you. The Canon EOS 700D features a smartphone like interface, that lets you touch the screen to indicate the area you want to focus on while taking pictures and videos, which gives you more control than the traditional autofocus points. The camera, though an upgrade on its predecessors, the Canon 600D and Canon 650D, does not seem to have an in-body improvement on the focussing system, but the bundled 18-55 kit lens from Canon now has a stepper motor that does a much faster autofocus, which makes the 700D seem faster than the earlier generation cameras. I usually don't recommend buying a DSLR with the kit lens, and, instead, buying lenses that you want to use, but the kit lens Canon includes is very agile, and silent, which comes in especially handy while shooting videos. The 700D also has predictive autofocus. The sensor on the 700D has 9 cross-type AF points. The focus points are superimposed both on the LCD when using live view mode and on the view finder when shooting. You can switch to manual focus by toggling the switch on the lens. My big peeve though is the viewfinder on the Canon EOS 700D. I understand that this is an entry-level camera, but since this is an upgrade from the previous generation, I would have liked Canon to make the view finder brighter than what we've seen before. At times I was worried if the photos that I am taking are properly composed and had to overcompensate with settings. I have been using a very high-end DSLR as my primary camera for about a year now, so I didn't have high expectations from the entry-level Canon EOS 700D, but the image quality on the camera was surprisingly good. Most of the low-light photos taken with the kit lens were shot anywhere between ISO 800 and ISO 1600, and I was worried about the images being slightly noisy. However, the camera handled these very well and the noise was barely noticeable, though images over ISO 3200 did show a bit of noise. If you want, you can take up ISO Settings up to 12,800 in the snapshot mode and 6400 in video mode, but I would really not recommend that. Canon also let us use their prime 28mm f/1.8 lens for some shots, and I was very happy with the way this worked. The Canon EOS 700D performed well in most situations, indoors as well as outdoors, and the lens also kept up with it. A few shots in the gallery were taken with the prime lens, specifically for getting the lights to look like stars, but with the bundled 18-55 lens too I managed to get some interesting shots. I am no fan of the on-body flash on any camera, and typically use a higher ISO and a lower shutter speed to achieve a better low light capture. However, at times you need the flash to freeze the moment, and just to capture things without changing settings. I loved the fact that Canon has included a non-flash auto mode on the mode select dial. This means you can turn off the flash fully, or you can go to the auto mode where the flash will automatically popup. I took a few street pictures with the flash on, and got some good fill results, which was good - there was no burning of faces and/ or over-lighting of the scene. The camera also supports a 5 frames per second shooting mode. 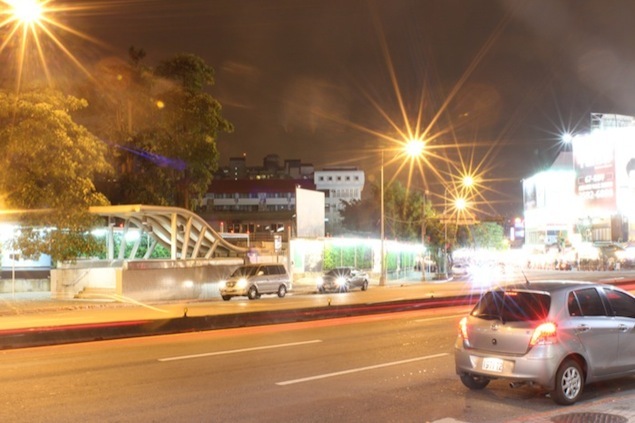 I took some street shots of cars whizzing past the Shinlin Night market in Taipei, and the scenes were nicely captured. From dawn to dusk, I took about 50 pictures with the camera using various settings, indoors, low-light areas, and brightly lit neon signs, and the camera performed well for an entry-level DSLR in all scenarios. I understand why Canon likes to call the 700D its flagship entry-level DSLR. One of the things that stood out for me when I had read the Canon EOS 700D press release of the new kit lens was the silent motor, and I really wanted to give it a shot. In scenes where you depend on the autofocus, you usually get the motor's hum, and then have to come back and edit that out in the movie. I took the camera out to shoot a small movie and the camera performed well. It was able to pick up sounds clearly and with the on-board stereo microphones, the quality of sound was very good, and yes, the motor was silent compared to the earlier generations. The 700D also supports external microphones (to be purchased separately). The battery on the Canon EOS 700D is rated at 400 shots and my testing gave similar results. On a four day trip across Hong Kong and Taipei, I did not need to charge the battery once, even though I was shot videos and a number of delayed-shutter shots, which can be battery intensive. The LP-E8 is the same battery that shipped in the previous generations, hence getting a spare battery is not an expensive affair in case you propose to shoot a lot of pictures. I was a little skeptical trying the Canon EOS 700D, especially when I realised that nothing much had changed in the body of the camera from the previous generation. However, the new menu and the kit lens did capture my attention, and once I started using the camera, it came out with flying colours. Right now, the 700D is one of the lightest DSLR cameras around, and it was really nice slinging it along on the trip. The new interface that Canon has built combined with the very responsive capacitive touchscreen were great to use. I was surprised to see myself play with the settings on the touchscreen rather than go through clunky menus with the buttons, even though I'm used to the latter. It was also nice to see an auto mode that disables flash. What really bothered me, however, is the viewfinder brightness, which takes some getting used to. You need to make sure you are not over compensating for images based on what you see on the screen. On the first few shots my settings were a bit off, as I am used to a different camera, but after the first few shots, things were much better. Those relatively minor issues aside, the Canon EOS 700D is a very good overall package. Though I'm usually not a fan of kit lenses as I said before, if you are thinking of buying the 700D, I strongly recommend you pick up the body plus kit lens combo, as the 18-55 is good value for Rs. 6,000 extra.